Chickpeas and green lentils with black quinoa, roasted onion, spinach and a mint dressing. Wholesome & herby Ready to steam in the bag. 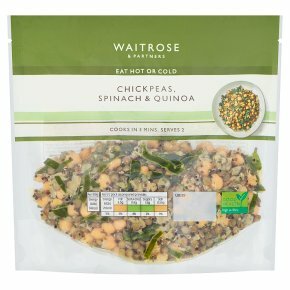 INGREDIENTS: Chickpeas (46%), green lentils (water, green lentils), black quinoa (7%) (water, black quinoa), onion, spinach, sunflower oil, mint, water, salt, lemon, ginger, garlic, black pepper, rapeseed oil.